Okay, it’s confession time. I’ve spent the better part of this year accosting young scantily clad men and asking them for a favour. No coercion has been necessary, they’ve been willing accomplices. They’ve happily done what I asked because it’s all in a good cause. 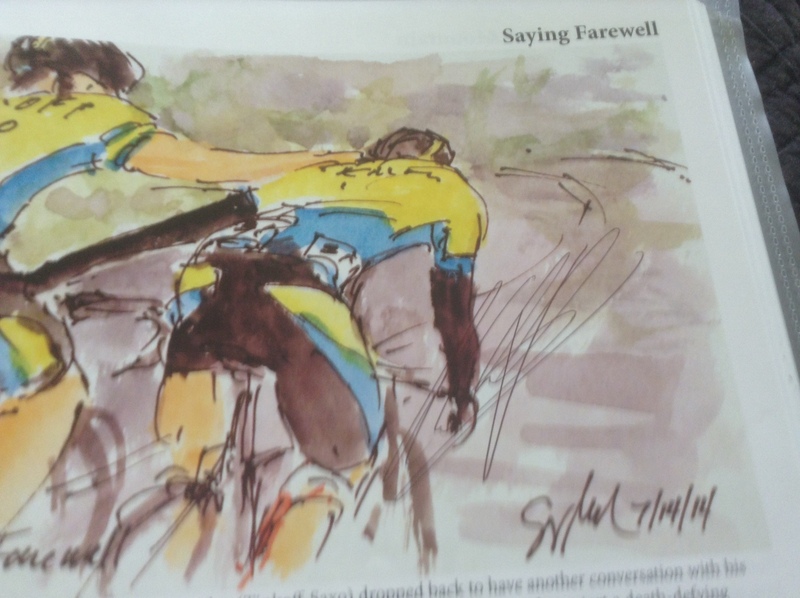 I am, of course, talking about my project to get signatures from professional riders featured in Book du Tour which will be auctioned for charity on Friday 25 September in Richmond at the Virginia Museum of Fine Arts. The project didn’t get off to the best of starts. 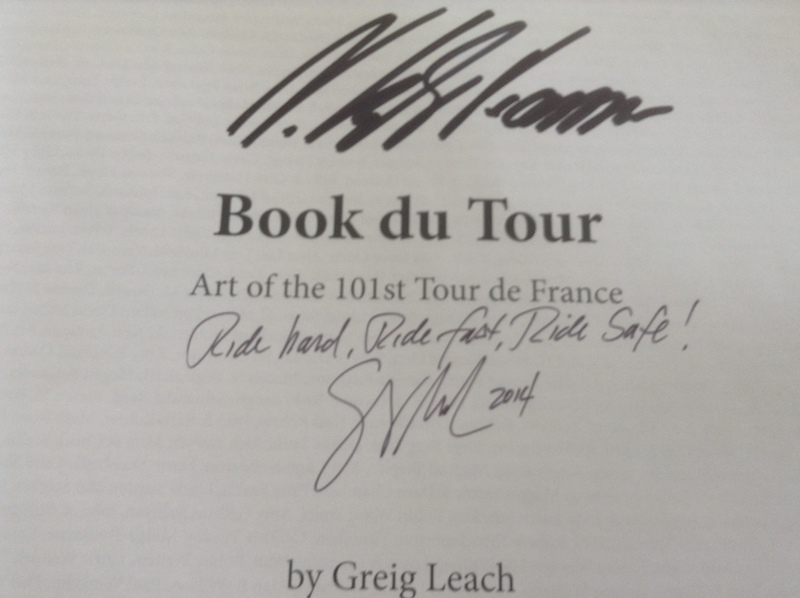 I’ve previously written about the delivery problems with the books and the challenges in obtaining Vincenzo Nibali’s signature. I’ve never been an autograph hunter, so I wasn’t sure exactly how I would fare. I was a woman on a mission and, more importantly, I had a plan. I went to the start of every race clutching a list highlighted with the names of my quarry. Lesson number one: it’s easier to collect signatures at the start and not the finish of any race. The first race of the season on my programme was the Tour of the Med – cancelled. At the Tropheo Laigueglia riders stay in local hotels, riding to the sign-on and start line. Lesson number two: you have to approach the riders when they’re not on their bikes or you need to be a lot fleeter of foot than me. There was torrential rain on day one of the Tour du Haut Var. Lesson number three: water and books don’t mix. It has to be dry. Day two I staked out Tommy Voeckler and Cheng Ji. Success – merely because their team buses were parked next to one another. Lesson number three: don’t be too ambitious. More rain at Paris-Nice meant no signatures. At this point in the season I wasn’t worried, I had an ace up my sleeve – the Tour of the Basque country. It’s a decidedly relaxed event and it’s easy to trap catch the riders at the morning sign-on. It didn’t hurt that I stood next to the two lovely podium girls, Miren and Eiharne, who had kindly offered to help me. Fortunately, there was no need for them to restrain or wrestle any of the riders to the ground. I say fortunately but I dare say the boys might have enjoyed the experience. Lesson number four: enlist the assistance of younger, leggier, beautiful girls or borrow a doe eyed poppet. 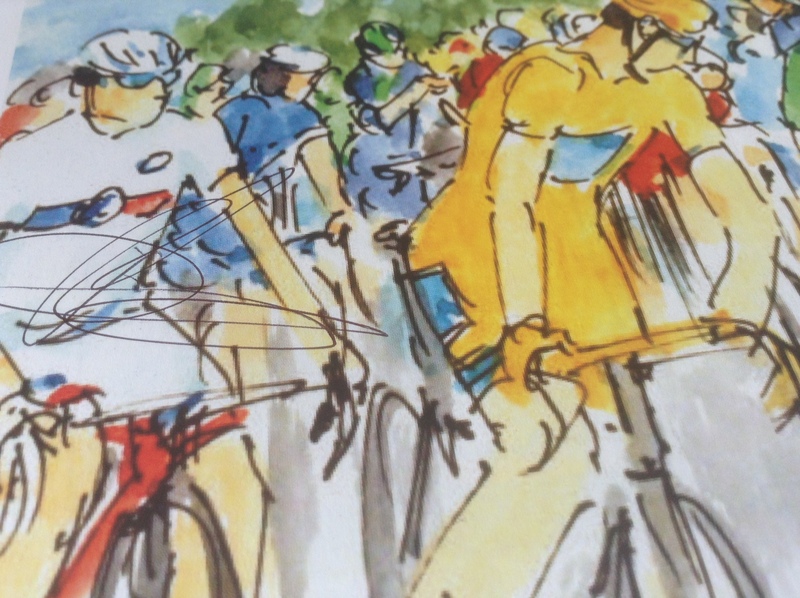 As a minimum, I wanted to collect the signatures of all the stage winners, jersey holders, top ten overall and the big names such as Alberto Contador and Chris Froome who were sadly DNFs. All but two of the top ten riders feature in the book. Laurens ten Dam managed to avoid Greig’s brush but, like Jose Serpa and his bandito tache, would have been instantly recognisable with his beard. The other MIA was Basque rider Haimer Zubeldia. I remember post-Tour everyone joking about Zubeldia on Twitter. He tends to finish well without anyone noticing. Greig didn’t either but I still collected his signature on the classification page. The organisers made my job more difficult at the Amstel Gold race by restricting access to the snake-pit to VIP guests while official press, photographers and team PR people were kept to the outer edges. 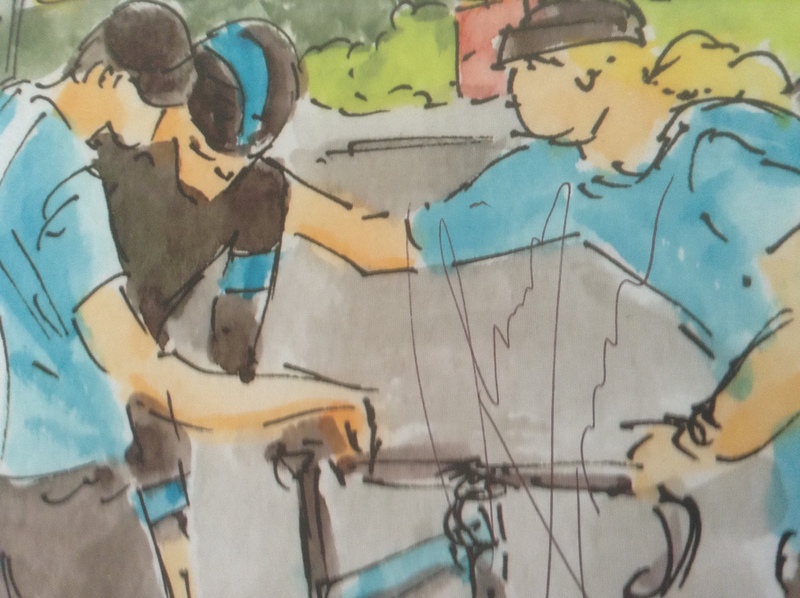 With riders streaming in and out from both sides, catching anybody for a signature was fraught. However, once they’d lined up for the start it was a much easier task and I collected signatures from stage winners (Ramunas Navardaskus) and contenders (Alejandro Valverde) alike. Lesson number five: be prepared to change tactics. La Grande Partenza of the Giro d’Italia held just up the road from me in San Remo offered more opportunities. I hung around at team hotels and press conferences, securing Alberto Contador‘s signature in the hotel garden. I struck out at the team presentation and on stage one. Lesson number six: don’t bother trying to collect signatures on the opening stage of a grand tour, the riders are too keyed up. A day in the Alps for the Criterium du Dauphine landed a couple of big fish namely Romain Bardet and Chris Froome. Riders of their stature tend to stay in the team bus until the very last moment. Lesson number seven: stake out their bikes and don’t move until they appear. Next up, the big one, the Tour de France. Getting signatures at the press conferences was much more problematical. Some teams held them in their hotels, others came to the press centre but not always with the entire team. Undeterred I managed to catch a few less in demand riders. In fact, one or two of them looked positively relieved that someone wanted to talk with them. I kept my powder dry until stages two and three, (see lesson six). Again, patience paid dividends. On later stages I managed to get the autographs of stage winners Mick Rogers and Alexander Kristoff plus a whole parcel of riders who feature in the book such as Jack Bauer and Luis Angel Mate. A few days back up in the Alps yielded Peter Sagan, a clutch of Europcar and Lotto-Soudal riders, but Mark Cavendish proved elusive. Ironically, he’s one of the few riders whose signature I’d previously secured on two separate occasions for friends. Just not this time. At the Clasica San Sebastian I successfully tracked down stage winner Blel Kadri. 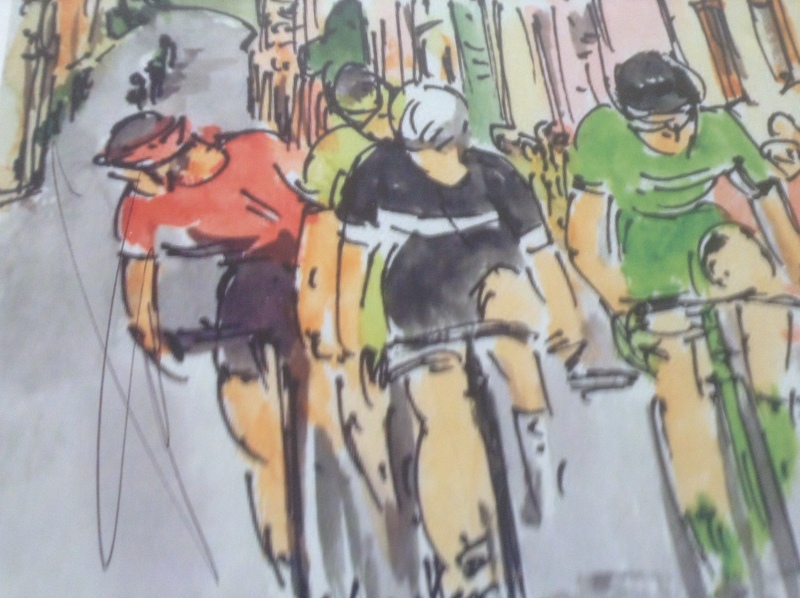 On to my last throw of the dice, the Vuelta a Espana. After failing to collect any signatures at the team presentations of the other two grand tours, I left the book behind for the Vuelta’s. Rookie mistake and lesson number eight: never make assumptions and always have your book with you. The teams were all relaxing in the nearby hotel and I could have collected autographs agogo. I skipped the opening team time-trial, but scored in subsequent stages securing signatures from Fabian Cancellara, Niki Terpstra and Mr Combativity, Alessandro de Marchi, to name but a few. I have secured the signatures of around 70 riders. My job is complete – well almost. 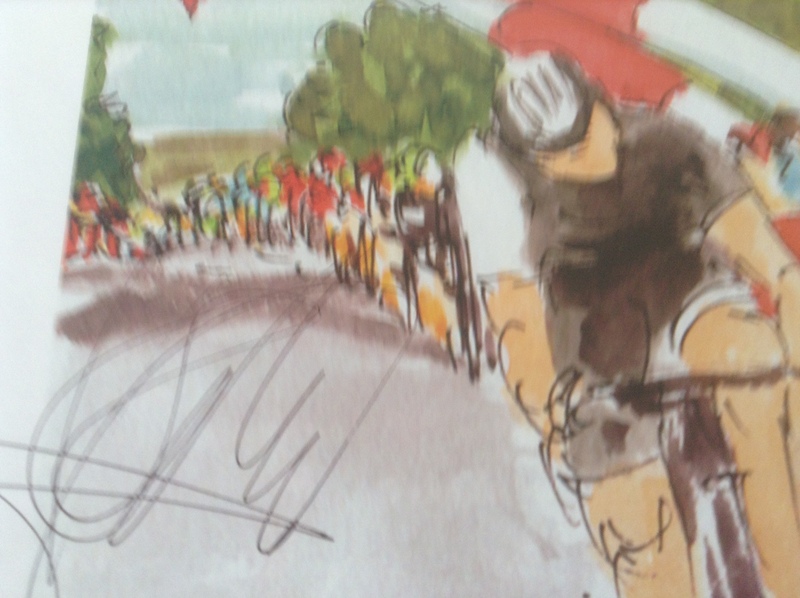 Alas, my path has not crossed that of four-time stage winner Marcel Kittel, whose autograph I secured for a friend at the 2014 Tour de France. Nor have I managed to get signatures from any of the fabulous women riders in La Course. However, there’s a couple of days before the book is auctioned on Friday 25 September so I’ll be on the look out beforehand. Thanks Maxine but there’s no need for Greig to buy me anything, It was such a fun project. I’m hoping it’ll go for silly money to a good home and the chosen charities will be pleased.